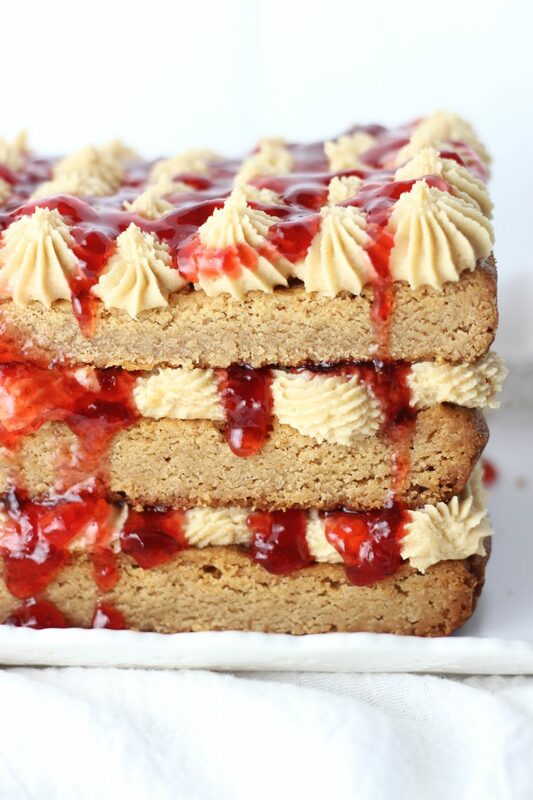 This Peanut Butter & Jelly Torte features thick peanut butter blondies are layered with rich, fluffy peanut butter frosting and strawberry jam! This Peanut Butter & Jelly Torte is straight-up awesome. 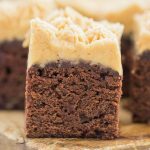 Ever since making this Peanut Butter Cup Brownie Torte, I got a little obsessed with making blondie or brownie tortes. I’ve never actually made a cake torte, but if we’re using the term ‘torte’ loosely, and you count tortes that are made from layers of blondies or brownies, then I’ve made many a torte. 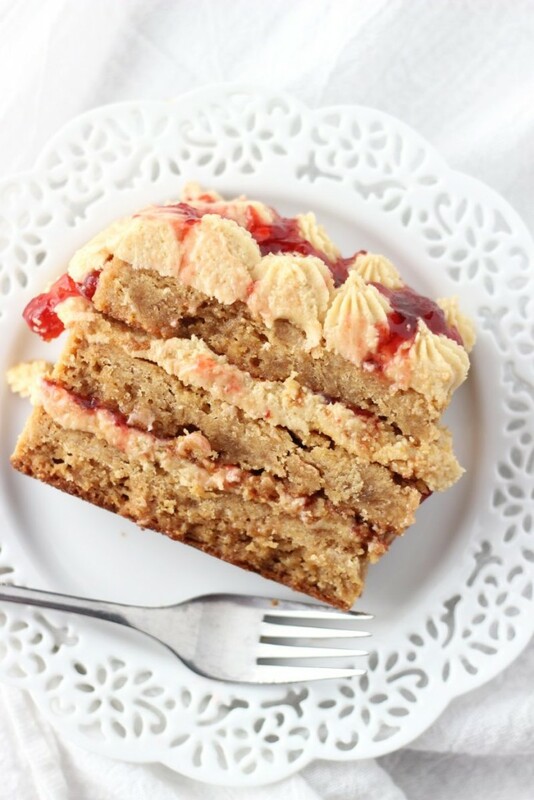 I love that torte recipe – it’s one of my favorite recipes on the whole blog. Layers of brownie with peanut butter frosting, chocolate ganache, and whole, full-size Reese’s peanut butter cups. It is as decadent as it gets. It almost can’t be outdone. This Red Velvet Brownie Torte is also great. The thick slabs of fudgy red velvet brownies with layers of chocolate chip cream cheese frosting are incredible. 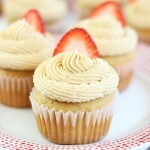 It’s such a decadent dessert too, but also so elegant with its vibrant red hue and unbeatable height! Recently, I also shared a nice blondie torte for fall: Maple Pecan Blondie Torte with cream cheese frosting. 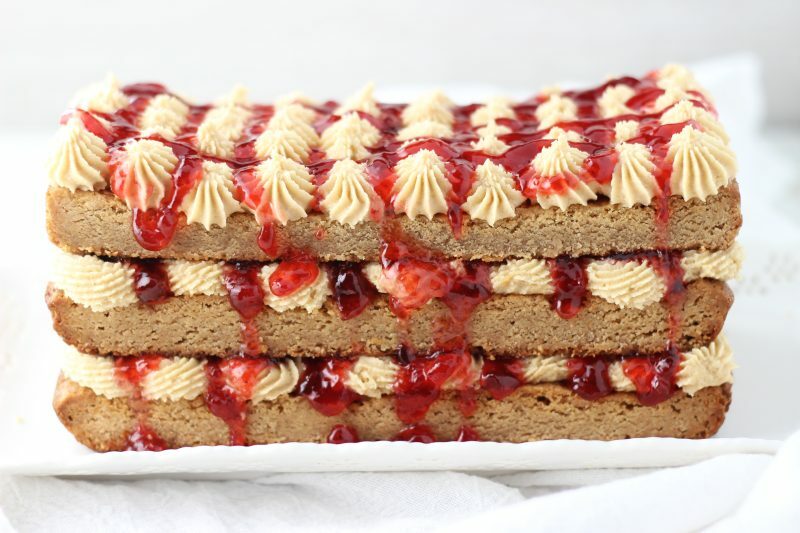 It was a natural next step that I would make a Peanut Butter & Jelly Torte. 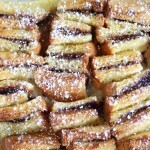 A favorite childhood meal, made into this beautiful dessert. This is your favorite childhood sandwich, dressed up into a beautiful, tall, and kinda fancy dessert. It’s surprisingly easy to make, and comes with a surprisingly short ingredient list. Most of these ingredients are already in your pantry! As much as it looks complicated to make with all the layers, it’s really quite simple. It starts with a pan of 3-ingredient Peanut Butter Blondies. 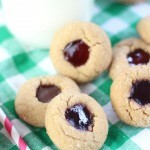 These bars are based on my favorite recipe for easy 3-ingredient peanut butter cookies. 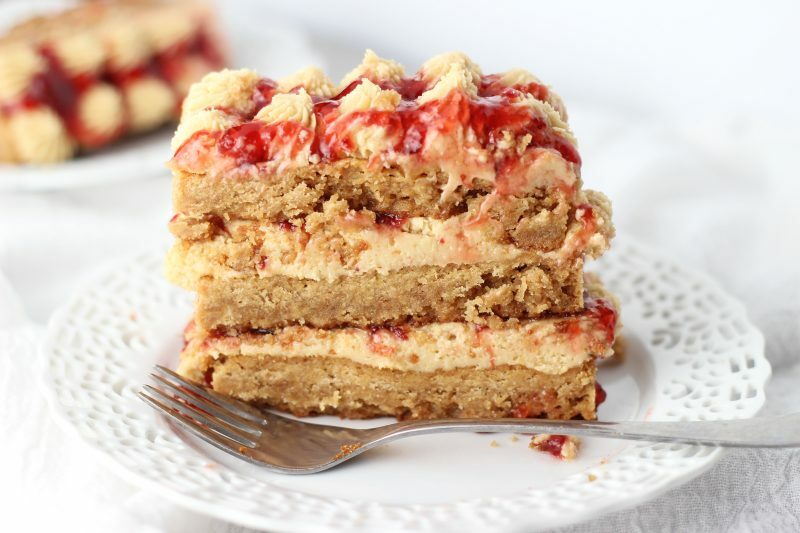 Instead of making cookies though, we press the dough into a 9×13-inch pan, and bake it into ‘blondies.’ Cut into three large sections, and stack the peanut butter blondies with thick layers of peanut butter frosting. 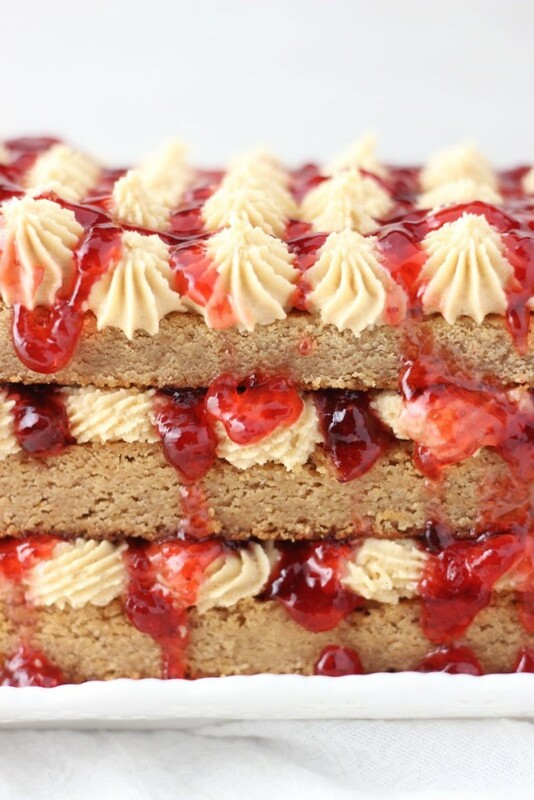 Give a generous drizzle of strawberry jam or strawberry ice cream topping on every layer, and you’re set. You can pipe the buttercream if you want a fancier look to this torte, but you can also just slather it onto each layer for ease. 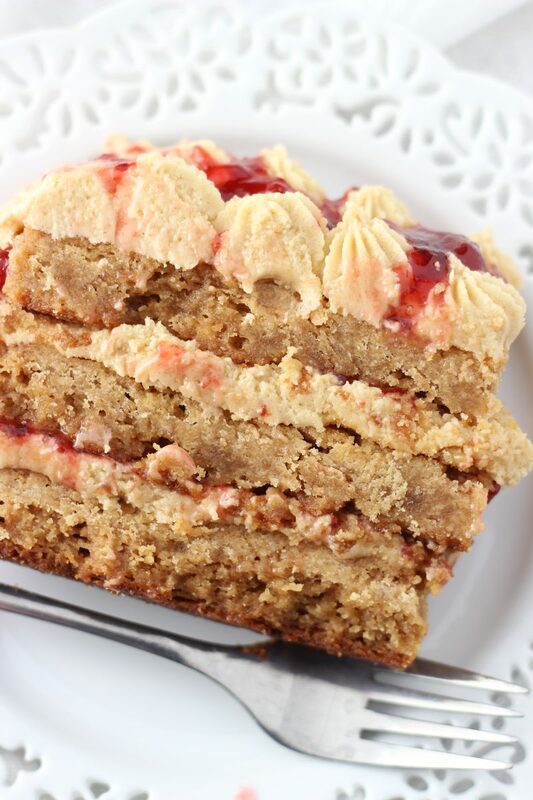 Either way, your end result is an ultra-rich and decadent torte, inspired by your favorite childhood sandwich – PB&J! Also check out these Peanut Butter & Jelly Cupcakes, these Peanut Butter Cup Brownie Cups, and this Ultimate Chocolate Peanut Butter Torte. LOL. 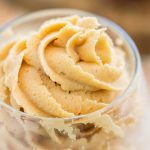 You came to the right place – it’s my fave food, so I always have lots of PB ideas! Thanks, Blair!